It’s been well-documented that weight stigma and weight bias, or discrimination and stereotyping based on a person’s weight or size, is rampant in our society. This is not just in the general public, but also within health professionals, employers, teachers, and other figures of authority. Although a lot of focus has been placed on the mental and social consequences of weight stigma, fighting weight bias is not just about “making people feel good about themselves”. Ignoring the clear mental health stigma embedded in that statement, weight stigma does impact physical health. Higher weight people are often reluctant to seek necessary medical care, are outright denied medical care, or told to lose weight for concerns that have a tenuous link, if any, to their size. A recent study found that those who perceived that they experienced weight discrimination were twice as likely to have high allostatic load, or multiple chronic medical concerns, even after adjusting for BMI. In recent years, obesity organizations have taken up fighting weight stigma as a cause, but seem to fail to acknowledge that the concept of “obesity” itself is stigmatizing. The word “obesity” itself comes from the Latin word obēsus, or “eaten itself fat”. Research has shown that “obesity” is considered stigmatizing, blaming and undesirable to people when it comes to discussing weight. While many obesity organizations recognize that weight is more complex than “eating yourself fat”, the term “obesity” still pathologizes larger bodies, by implying that a body is automatically unhealthy when its above a certain size. In 2013, the American Medical Association leaned harder into this idea, declaring “obesity” a chronic disease, against the advice of its Council on Science and Public Health. The Canadian Medical Association followed suit in 2015. Noting that one of the main arguments against obesity is that the current diagnostic criteria (BMI > 30) is unreliable, there has been a push to adopt the WHO’s definition of obesity: “abnormal or excessive fat accumulation that presents a risk to health”. Still, this definition leaves many questions unanswered – what is considered “abnormal” or “excessive” fat accumulation? How do we distinguish when fat “presents a risk to health” versus when a person just becomes sick while being at a higher weight? Is presenting a health risk enough to be considered a full-blown disease? Some may argue, “It’s not the person we want to get rid of, it’s the ‘obesity’.” This, and the push to use “people first” language, is actually problematic because it paints a picture that we’re all just thin people living in different sized bodies, and “obesity” is an external object that we can pick up and put down as we please. Meadows and Daníelsdóttir also point out that “people first” language is only used for “toxic” versus “benign” labels. For example, we don’t call a German person a “person with German-ness”, or a tall person a “person with height”. Our body size is part of how we interact with the world, and how the world interacts with us. But… Wouldn’t it be Better if People Lost Weight? Contrary to popular belief, HAES does not deny the correlation between higher weights and certain medical conditions, like heart disease or diabetes. However, it calls into question the assertion that weight or body fat is the cause of these conditions, and whether weight loss will improve health. All of the so-called “weight-related co-morbidities” present in thinner people – thin people get heart disease, diabetes, arthritis, depression, and so on. We are all aware of the multiple factors that can contribute to each of these conditions—genetics, aging, other medical conditions, lifestyle, just to name a few. So, why the focus on weight? Perhaps because it is easily measured and thought to be something that we can change. I think the latter part is what sets HAES apart from conventional approaches—we see that weight is not something we really have control over, and trying to lose weight may actually cause harm. Do 95% of Diets Fail? Many HAES and non-diet practitioners cite the statistic that “95-98% diets fail”. I’ll admit that in the past I even thought, “Surely we know that diets don’t work, but ‘sensible weight loss’ is OK.” However, as you will see in the studies cited below, the research is not on commercial weight loss programs or even named diets like low-fat, keto or paleo. It’s any lifestyle intervention with the goal of intentional weight loss. A stronger criticism of the “95%” statistic is that the original source of this statistic comes from a paper written in the 50s, with more recent quotes of this statistic in the early 90’s. 🙈 Surely weight science has improved since then? Not by much. Part of what makes this statistic so elusive is that there is little agreement on what is considered “weight loss success”. In a 2005 systematic review that defined weight loss as “losing at least 10% body weight and keeping it off at least one year”, researchers found an only slightly better success rate – 20%. In a recent presentation for EDRD Pro, Dr. Laura Thomas argues that this number is likely skewed up due to publication bias (i.e. weight loss studies that produce null results unlikely to be published and included in this review) and observation bias (i.e. study subjects usually have more follow-up than “real life” situations, often leading to better results). I would also add that many people would not consider a 10% weight loss a “success”, and that most would hope to keep the weight off for more than one year! So even though we don’t know the exact statistic, it is safe to say that the vast majority of weight loss is unsuccessful, or as I like to say, weight loss is statistically improbable. Even at last year’s Canadian Obesity Network summit, presenters often referenced this study, which found that in amongst 7,000 patients attending a medical weight loss clinic for over 7 years, over 70% of patients lost less than 2% of their starting weight, despite being followed by a multidisciplinary team that consisted of doctors, dietitians, behavioural therapists and exercise specialists. This was an actual slide from the presentation that showed the actual number of patients in each group, while the paper shows the statistical probability that a patient would be in each group, thus the different numbers. So What if People Don’t Lose Weight? It Doesn’t Hurt to Try, Right? Continuing to promote weight loss is problematic from a social justice standpoint because it continues to uphold the notion of an “ideal body” and that some bodies are better than others. From a health standpoint, we know that attempts at intentional weight loss are actually correlated with emotional eating, disordered eating, weight cycling and weight gain. In an oft-cited review, Mann et al found that “one third to two thirds of dieters regain more weight than they lost on their diets, and these studies likely underestimate the extent to which dieting is counterproductive because of several methodological problems, all of which bias the studies toward showing successful weight loss maintenance”. In a study of twins, Pietiläinen et al found that intentional weight loss of at least 5 kg (~11 lb) was associated with weight gain, even after just one episode of weight loss. Even if you didn’t care about the social justice piece, wouldn’t it make sense to stop providing a “treatment” that is associated with the opposite effect of what it’s supposed to do? Aside from some of the research I’ve shared above, some good places to start might be this review by Tylka et al., this review by Bacon and Aphramor and learning more about the HAES principles. In practice, many of the recommendations by HAES practitioners are similar to those of conventional practitioners. The only difference is, instead of false promises that “eating healthy”, “moving more” and other self care practices would lead to better health through weight loss, we focus on caring for the individual as they are right now, while advocating for changes in our environment and other social determinants of health, which arguably have a larger effect on our overall wellbeing. Ready to focus on health, not weight, but not sure where to start? 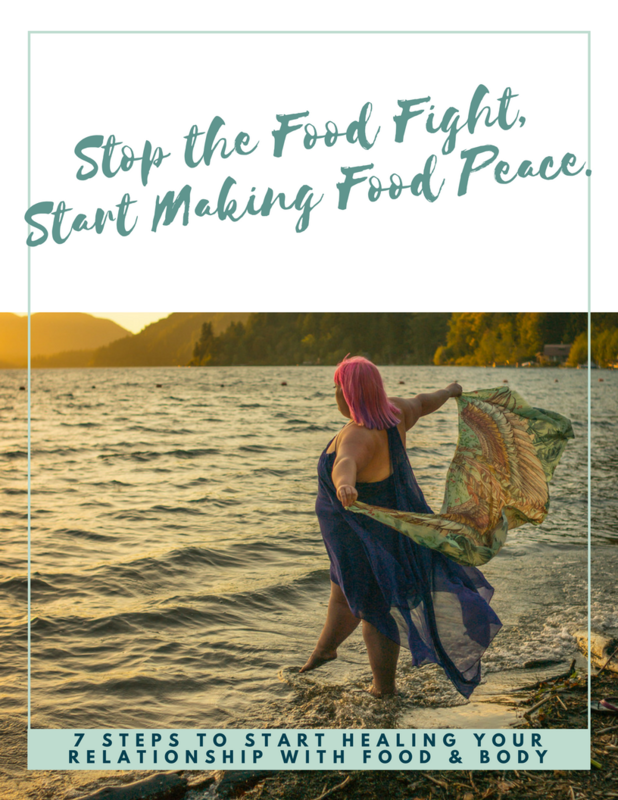 Download my free eBook, Stop the Food Fight, Start Making Food Peace. I really enjoy reading your posts Vincci. What do you think about people being aware of portion sizes and the amount of food their body uses in a day? This could be seen as a form of weight management, but it’s something most dietitians do themselves to maintain a stable weight. So, to answer your question, it depends on the intention as to why this person is being aware of their portion sizes or the amount of food their body uses in a day. (I’m not sure how to measure the latter, though.) Maybe they notice different portion sizes are more satisfying than others, affect their postprandial blood sugars differently, or their GI symptoms. That is well-within HAES®. But if the intention is based on the belief that changing portion sizes will change their body weight, then that has the potential to be problematic. Excellent! Such a comprehensive and thoughful summary! That’s a lot of research you put into this. Thank you for the great summary! Thank you for this. I love it!